The city of Bottrop is located between Oberhausen, Essen and Gladbeck in the northern part of Germany’s Rhein-Ruhr Metropolitan Region. One of its most popular residential districts is Fuhlenbrock, and it is here, in a typical residential development built in the 1970s and 1980s, that Edin Covic lives. From outside, his house looks like any other in the street. Inside, however, thanks to Covic’s passion for technology – or more precisely KNX technology – it is one of the “smartest” buildings in Bottrop for this electrical systems installer has equipped his home with the smart KNX Bus System. Originally, as Covic tells it, his idea was simply to understand KNX technology from the ground up and familiarise himself with its potential. Today, however, as he admits, he would no longer want to be without these new found creative comforts, being able to control light or music via a touch panel, tablet or smartphone, for example. But now Covic wants to go a step further, to convince others of the advantages of this technology. So he is using his home as a showroom. Open-plan, modern and spacious, the 120m2 apartment gives potential buyers the chance to try the technology out for themselves. Here, customers can see exactly what the intelligent KNX system can do. And for many, it is a real eureka moment, for only a very few have any experience of home automation technology and devices such as tactile sensors and panels. 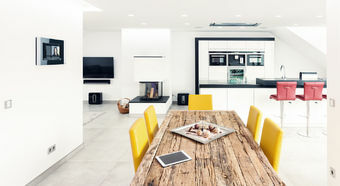 The JUNG KNX Smart Pilot is mounted on the wall in the middle of the dining room. Easy to read with its impressive 19” screen, it can be used to select functions such as lighting and music by touch. 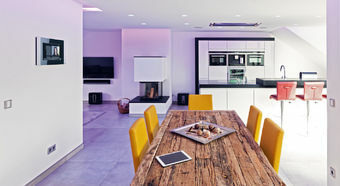 Speakers installed in the living room ceiling provide a Dolby Surround system for the home cinema, with a Sonos system also operating as a music system. If the television is set to mute, Covic can fill each room, including the terrace, with the music of his choice, and in party mode, music can be channelled into all the rooms at once. It is easy to operate – even for KNX novices – thanks to the intuitive JUNG user interface on the Smart Pilot. In addition to music, Covic can also operate his lighting centrally. From simply turning lights on and off to the selection of various lighting effects, everything can be regulated easily using the Smart Pilot. For example, with a touch of the screen, Covic can create a cosy atmosphere in the living room, relaxing lighting in the bathroom or bright light in the kitchen. 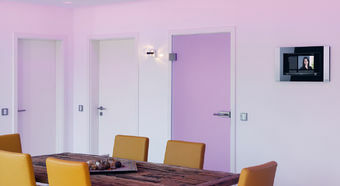 All this is made possible by BRUMBERG’s vitaLED coloured light system controlled by JUNG KNX technology. 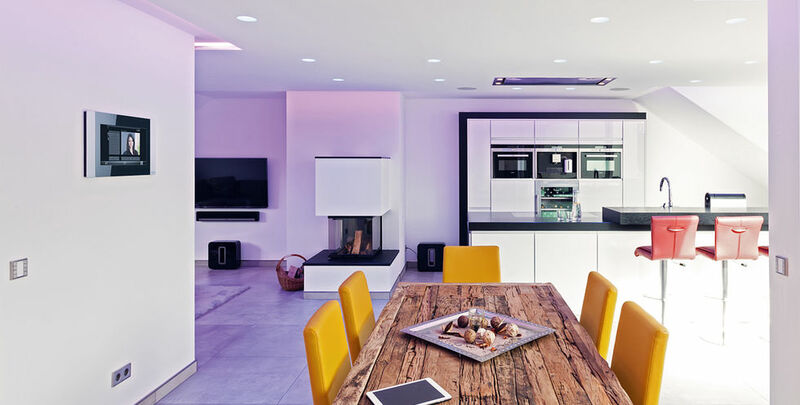 As well as the RGB (red, green, blue) colour space, the system also provides for infinitely variable adjustment of the white-light range by KNX Smart Pilot, tablet or smartphone. At the same time, the lighting can also be operated using KNX push-button sensors. At first glance, the F50 push-button sensors look very similar in size and general appearance to conventional JUNG switches. In this case, however, the elegant design of the classic LS 990 switches in aluminium conceals intelligent KNX technology. Safety in the dark is guaranteed by LED aluminium pilot lights from JUNG’s classic LS 990 range. These pilot lights – incorporated into SCHUKO® sockets and switches – provide enough light for a night-time trip to the bathroom, for example, without turning on the main lights. 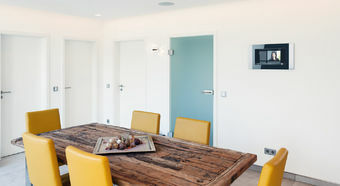 All in all, the Bottrop Penthouse surprises visitors and customers all along the line with its smart technology and carefully considered electrical installation which provides the perfect solution for smart living. LED orientation light The SCHUKO® sockets with integrated LED light provide enough brightness for orientation purposes, so that it is not necessary to turn on the main lighting in the dark. VitaLED Vibrant light brings people's performance curve into harmony with their biorhythm. That has been scientifically proven. That is why the vitaLED coloured light system was developed by Brumberg in cooperation with the South Westphalia University of Applied Sciences. 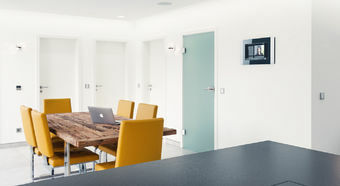 Now JUNG is incorporating the control of this smart light system into the intelligent KNX building technology. LS 990 Aluminium The original LS 990 in real aluminium shows cool elegance in a classic square design. This version gives modern electrical installations an especially clear, purist appearance.